Schools are a haven for education. We trust that our children and the public will be safe on school grounds. But budgets are tight. Your in-house staff doesn't have time or knowledge of what to look for. 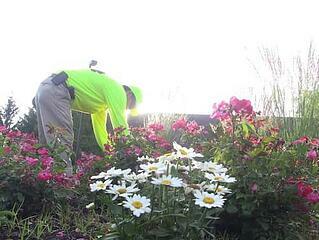 There could be hidden dangers that only an experienced landscaper can uncover. Let's explore some potential liabilities that may currently exist on your campus. This could present safety concerns for students and faculty. “Line of sight” is a very important security feature, and shrubs need to be pruned to help with this. Removal of overgrown plant material is certainly an option. Consider replacing it with the “right plant in the right place.” A good design can have curb appeal and keep your school grounds secure. Another option is dormant pruning. This process is done in the winter and can reduce the size of overgrown shrubs to a manageable level. Neglected trees result in injuries and bothersome conditions to campus students and guests. They poke people in the eyes. Dead branches may fall on bystanders. Kids climb them, and occasionally fall out of them. A solid arbor care program can solve these issues. Branches can be limbed up to prevent climbing and allow passage underneath. Hazards such as occluded bark and “widow makers” can be identified and addressed. Disease problems can be identified before the tree succumbs to issues and needs to be removed. Most of the time we don't think of grass as a danger until somebody twists their ankle in a hole. The professional landscaper knows to look for these hazards as well as drainage issues (mosquitoes), yellow jacket nests (insect stings) and overall health of the grass (reputation). Sports fields need even more hazard identification so that no one is injured playing baseball, football, soccer and the like. Overseeding, rolling, aeration, and topdressing can solve all these problems. With people comes trash. And vandalism. And broken glass. Programs can be put into place to service trash receptacles and pick up debris on a consistent basis to maintain clean, safe grounds. Now you have water leaks and mud and sprinklers turning on at the wrong time. You’ve got rain sensors that are improperly calibrated and as a result, soggy turf with puddles that, again, attract mosquitoes. With a landscape company these problems are solved by an irrigation technician who knows the site and the weather patterns. You've got parking lots and walkways. And they get snow. Sometimes a lot of it. Most landscape companies that are based in snowy areas also double as snow contractors. It's not as simple as it sounds. Over the last 20 years there has been a lot of science introduced to the snow and ice industry. Trucks are calibrated to put the right amount of salt down to help avoid slip and falls. This sustainable practice also helps control over-salting, which reduces our impact on the environment. There are ways to pretreat (with liquids) at cost-effective rates to get better results at the end of the storm. Many contractors hire meteorologists to help them with decision-making. Plus, it can take immense manpower and equipment to battle storms. Many schools don't have the budget or staff to handle these scenarios. All in all, it really comes down to expertise when judging issues on a site. Safety on campus is paramount and you may need an expert to guide you. Make the call today!